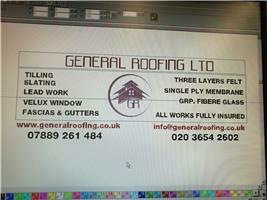 General Roofing Ltd - Fascia/Soffits/Guttering, Roofer based in East Barnet, Hertfordshire. We are an Experienced Team with more than 20-years of roofing experience in ANY aspect of roofing work. ANY FLAT ROOF SYSTEM.. e.g.. SINGLE PLY FLAT ROOF SYSTEM..
Any other building work under taken.